Christmas is coming earlier thanks to a friend, Paula. Well- a friend of friend, who wanted to go to Chanel, which was a very bad move. I never thought that I'd leave with a bag in my hands, which I did. I got myself that pair of Chanel espadrilles which every fashion bloggers seem to have. I got it in leather though. When I tried it in the boutique, it was so smooth and comfty. I was totally sold on the spot. After being told that it was the brand new stock delivery and they only had one size for each shoe model, it convinced me further more to buy it. I left the shop all happy and smiling hoping that summer is around the corner. Paris is a really beautiful city especially during this festive season. Light decorations are up everywhere. People are buzzing around everywhere preparing christmas presents for their loved ones. From the Chanel store, Paula and I walked to Place de Vendome and to Opera. The wind was icy cold. Funnily, we bumped into a crowd of fans waiting for Infinite when we went to Pierre Hermé near Opéra. It's strange because I never have luck with celebrities, apparently neither does Paula. It would seem to me that negative + negative leads to positive luck. Infinite is a korean boyband who are having their world tour. I hardly know them, but Paula is their fan, so we waited for sometime, till we were frozen- to see L zooming out so quickly that I hardly saw him at all. It was funny to see that the french were really curious who all the fans were waiting for. Almost everyone who passed by were asking non stop. I was actually surprised that some actually knew them. 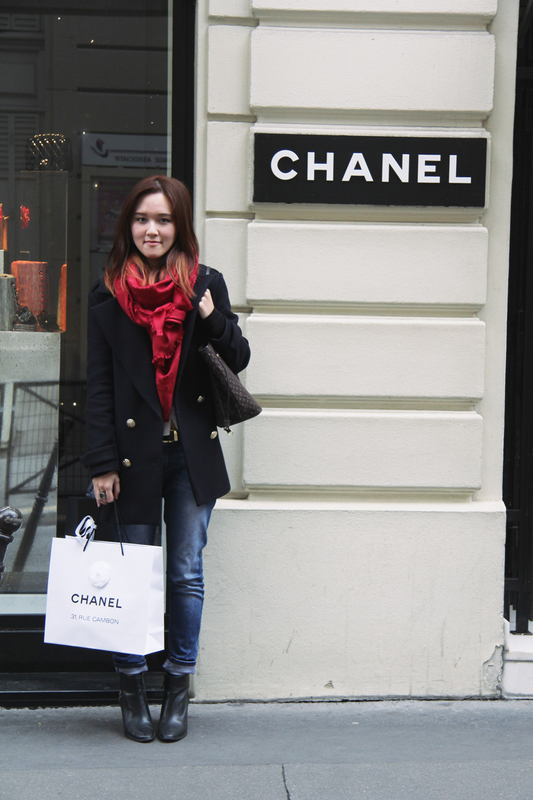 As quick as how L left, we also quickly left to go to Galerie Lafayette to warm ourselves up. The streets were flooded with people everywhere. It was impossible to move around at Galerie without worrying about squashing our Camelia flower. We were sardined compactly, moving in lines just to get to the escalator. It was super crazy, I've never been to any places like that. I guess it's the christmas shopping that everyone's busy with. We ended the day with a new YSL Rouge Pur Couture, some escargots and foie gras for Paula to taste real french food, not forgetting smiling and aww-ing at Kim Tan and Choi Young do even if the ending of episode of 16 was so sad.